When we are young adults and teenagers we are hyper focused on social cohesion. Why? Social cohesion is the process of acceptance and recognition of one’s potential by social institutions, and integration into society through study, employment, volunteer work, or other forms of civic participation. Social integration is of particular importance at the transition to adulthood for those who may come from disadvantaged backgrounds or live in precarious conditions, and for those who aspire to take on positive leadership roles and advocate for others. Achieving social inclusion often involves breaking personal and social barriers. Often 18-25 year olds are dismissed because they lack the skills needed to build coalitions and realistic campaigns to address inequalities. The Global Youth Village is designed to work with young leaders and provide them with tools to build inclusion, tolerance, community cohesion, and social justice into their mindsets and communities. 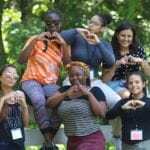 Through the experience of building a micro-model of the global community in the foothills of the Blue Ridge Mountains, the participants establish a network of youth practitioners who are working diligently for positive social change.GYV participants develop leadership and dialogue skills through the LivingSidebySide® curriculum.